You can survive up to three weeks without food, but only three days without water. Scary, isn’t it? Therefore, it wouldn’t be that much fun to find yourself in a situation that would test your limits, at least when it comes to essentials such as water and food. Fortunately, experts for emergency situations and outdoor adventures have invented a magnificent little thing called the water filter. Water filters can be an amazing addition to your hiking backpack, survival kit, and even that small bag you carry around every day. They’re small, lightweight, and can literally save your life. The backpacking water filters market has started growing ever since we’ve all become aware of the importance of proper preparedness for any unexpected situation. Hence, the variety of water filters is extraordinary. Here are our top 5 picks to help you find a backpacking water filter suitable for your needs. Check out our informative descriptions to learn more about each backpacking water filter and easily make your choice. Main Features: Katadyn Hiker Pro Water Filter is a water filter with a pump that makes it simple to filtrate water in any situation. It provides enough drinking water in no time by cleaning one liter per minute. 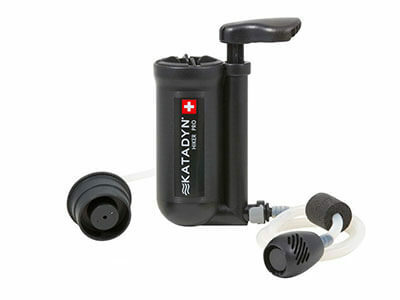 Katadyn Hiker Pro Water Filter is an extremely easy-to-use backpacking water filter. This isn’t a water bottle with a small filter, this is a full-size filter with a pump. It comes with a handy hose that should be put in the water you want to filter. The other end of the hose should be put in a bottle or a glass. It’s very convenient for groups of hikers or families in an emergency since you don’t have to drink from the same bottle. Katadyn Hiker Pro Water Filter is ideal for any outdoor activity, but it’s also a highly useful addition to any survival kit. The filter itself is of the highest quality. It can remove dangerous bacteria like giardia and salmonella from the water you plan on drinking. Katadyn Hiker Pro Water Filter also cleans water from numerous types of protozoa and other water-borne pathogens. In addition to this, Katadyn Hiker Pro Water Filter uses activated charcoal to reduce the bad taste and odor of stagnant water. It’s great to have Katadyn Hiker Pro Water Filter in your bag in any situation. It’s not only an extremely efficient water filter, but it’s also easy to pack and can be effortlessly cleaned. Main Features: Sport Berkey Water Filter Bottle uses ionic adsorption microfiltration for superb water filtering. The bottle itself is made of BPA-free material and doesn’t affect the quality of the filtrated water. Sport Berkey Water Filter Bottle is primarily created for gym goers and people who regularly engage in outdoor activities. Its sleek design makes it extremely convenient for exercising or traveling, but when you learn about its filtering ability, you’ll realize that every prepper would be happy to have such an item in their survival kit. Sport Berkey Water Filter Bottle filters water utilizing medical grade technology of ionic adsorption which helps remove harmful substances from water. Ionic adsorption cleans water from heavy metals such as chromium, mercury, aluminum, cadmium, copper, and many others. But heavy metals aren’t the only dangerous substances Sport Berkey Water Filter Bottle can filtrate. This amazing water filter also eliminates numerous bacteria, protozoa, and other pathogens. Furthermore, Sport Berkey Water Filter Bottle reduces the level of chlorine pesticides, herbicides, detergents, petroleum-based products, and many other harmful chemicals. Finally, Sport Berkey Water Filter Bottle makes water drinkable by removing unpleasant taste and odor. 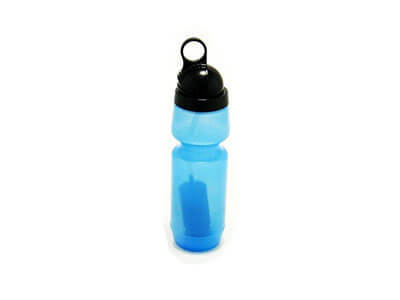 To use Sport Berkey Water Filter Bottle, you need to learn how to wash and store it properly. The bottle and filter should be cleaned with a chlorinated solution of ¼ tablespoon per ½ gallon of water and left to dry well afterward. Main Features: Super Sterasyl 7” Ceramic Filter is an excellent ceramic water filter that claims to provide the cleanest water ever. It’s compatible with Berkey water systems. Ceramic water filters have been in use since the 1870s and they’re still doing a great job providing outstandingly clean drinking water. Super Sterasyl 7” Ceramic Filter is a premium water filter designed to easily fit in your backpack or survival kit. It is a bit heavier than the majority of filters nowadays, but its efficiency makes up for the weight. Super Sterasyl 7” Ceramic Filter is one of the best backpacking water filters currently available. It’s extremely powerful and provides an extraordinary level of filtration. Super Sterasyl 7” Ceramic Filter is able to remove 99.99% of bacteria from any contaminated water and make it perfectly safe to drink. In addition to that, Super Sterasyl 7” Ceramic Filter contains silver that helps inhibit the growth of bacteria. Besides the bacteria, Super Sterasyl 7” Ceramic Filter is also very efficient in reducing or removing numerous water-borne pathogens. And that’s not all; it helps with dangerous chemicals as well. Super Sterasyl 7” Ceramic Filter cleans water from pesticides, herbicides, and even heavy metals. If you have the Super Sterasyl 7” Ceramic Filter, you don’t have to worry about water no matter the situation you find yourself in. 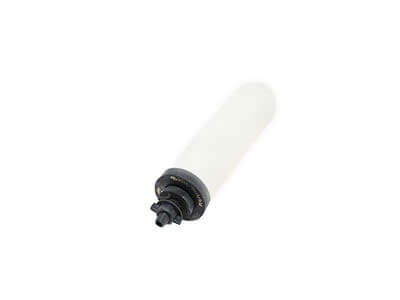 Super Sterasyl 7” Ceramic Filter can filter turbid water, so you can rest assured that it’ll keep you safe and hydrated even in the case of a severe flood or any other disaster. Did you know that about 60% of the human body is actually water? Well, now you do. And that’s just one more reason why water is so important for our survival. The trouble is that water is pretty heavy, meaning it’s impossible to pack enough of it when we go hiking, for example. Fortunately for all travelers, backpackers, and serious preppers, scientists have come up with a solution – the backpacking water filter. Nowadays, there are many different types of water filters. They come in various dimensions, shapes, and capacities, it’s up to you to choose the model you like the most. The best backpacking water filters provide a high level of water filtration, no matter the circumstances. They’re able to clean even stagnant and horribly turbid water. All these excellent filters can remove dirt, chemicals, bacteria, protozoa, and many other harmful particles from the water you intend to drink. All you have to do is find a backpacking water filter that can meet all your requirements and perfectly fit in your hiking backpack or survival kit. Our team has chosen 5 backpacking water filters for you – they are the best of the best, meaning you can’t go wrong whichever you decide to purchase.